'Efemera Ink' is both the name of a monthly crafting get together in my local area run by 'Effie' and it's also the name of Effie's blog which regularly features her inspirational altered items and mixed media projects. Reading Effie's blog makes up for the fact that I can't get to many Efemera Ink craft days [or 'glue 'n stick' as they're affectionately termed!] due to an inconvenient distraction know as 'work'. Luckily, now term has ended I'm hoping to get to a few more. This is Effie's finished example of the wallhanging we were to take inspiration from during her March 'Efemera Ink' workshop that I somehow managed to attend! For more images and to hear Effie's take on the workshop have a read of her post here. After talking us through her process in the morning we all spent the day interpreting the idea using the provided ingredients but adding in our own finishing touches to personalise it. We stamped into the embossing powder on the heart while it was still warm so that the stamp leaves an imprint: My 'heads' background stamp is by Stampotique from Art From the Heart and then I cut two little heads free from the crowd, mounted them on to chipboard and embossed over the top with UTEE: As I mentioned, it now hangs in my hallway and here it is in situ: As someone who's always been generally quiet in group situations, I never thought I'd be the kind of person who enjoyed crafting in a group like Efemera Ink. But I do. A lot. It's always good to see how we all work in entirely different ways to produce items which, while similar in construction, are totally different in detail. So, if you're thinking about joining a group but don't think it's for you, pleeeeease give it a try. At least once. You never know where it might lead. Before I met the Effie and the 'Efemera Ink' ladies I didn't know any other crafters in my area. Now I attend the workshops when I can, the crop each month with many of the same faces, a group of us get together twice a year for a crafting retreat in a country cottage and Jean who brings her shop [3DJean] to the crafting days recently asked a handful of us on to her 'Scattered Scarlet' design team! Oh and ... crafting groups are also a perfectly wholesome way to get you out of the house, drinking tea, chatting with fellow crafty types and wherever there's a group of crafters there's, more often than not, an opportunity for eating cake! Who could argue with that logic? If only! There are no groups around me, and a while back I was considering starting one, but then life got in the way. Perhaps I should make more of an effort once we've sold the house, moved, had the baby... erm... maybe I should just look harder. P.S. Loved that creation ever since I saw it on your twitter profile. That stamp is ace. 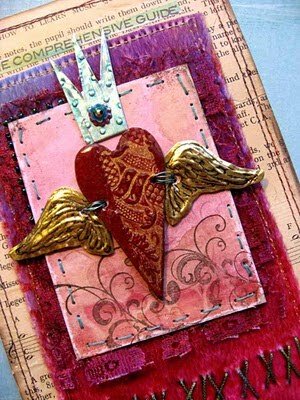 Love your creation - I just scrapbook, but love to see altered art - wish I was creative like that, but I am most definitely not! I joined a local crop just after I started scrapping and made very good friends with 4 of the 'girls' there. When the crop folded we decided to carry on meeting and so meet up about once every six weeks, taking it in turns to host. We have such a laugh, drink coffee/tea/hot chocolate or coke (depending on the weather) and always have something scrummy to nibble on! We also get scrapping or card making done too! Sarah - yes I think you shouold just keep an eye out for a group near you .... wedon't want you having a meltdown for that sake of crafting and cake eating! Becky - how great that you managed to keep the group going in your own homes. When my Mam and sister and I decide to have a crafting day we always seem to end up at my house due to the fact I have the largest dining table to sread our stash across! They bring the cakes though - so I don't mind! Oh and Becky - honestly if you attended one of Effies workshops you could easily come out with a project liek that - she makes it so easy for us all to look as original as she is! I love attending my local scrapbooking crop or meeting up with crafty friends. More often than not, we manage to do more talking than creating but there's also a bit of 'show and tell' and a bit of 'technique talk' - as well as the tea and cake, of course. I *do* more when I create by myself, but I love the teach and learn aspect of being with other crafters. By the way, I really love both versions of this wall hanging. Effie's rich and warm version and Julie's light and bright version. Both so different, but using similar techniques. I suppose it highlights the point of sharing, learning and then creating on your own terms! I attend a monthly get together with some very good crafty friends - in fact, if it wasnt for being persuaded along, I would never have started scrapbooking, which would never have led me to all the other crafty endeavours that I love so much. I always had the mindset that I was no good at art, and had nothing of value to scrapbook (having no children - and I thought that scrapbooking was all about your children - I was so, so wrong!). It is often difficult to make time to attend, and often means reorganising schedules and sorting out my priorities. I have learned that it is definately a priority to attend if I possibly can - it keeps me sane, and means that I have dedicated time away from distractions of home and work to just play and create - even if I do sometimes acheive nothing more than drinking tea, eating cake, chatting and admiring everyone's creations! I wish there were groups around me to join ... alas, for now, I am a solitary crafter. Perhaps once I transfer to an art school this will change.. I have kind of a different outlooks on this article. I agree with the author but some points I have different views on.